"Observations on the Natural History of the Cuckoo. By Mr. Edward Jenner. In a Letter to John Hunter, Esq. F.R.S." 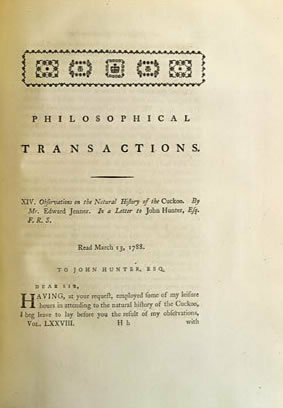 Philosophical Transactions of the Royal Society of London. 1788. 78: 219–237. Jenner, a physician and student of John Hunter, is credited as the father of immunology, thanks to his experiments with the smallpox virus and inoculations. Much of his success in addressing the smallpox epidemic stems from his powers of observation regarding those who had contracted the disease. Jenner shares his observations on the behavior of the cuckoo in the present article.